A couple living on Wales' longest trunk road fear for their safety because of difficulties getting a disabled parking space. 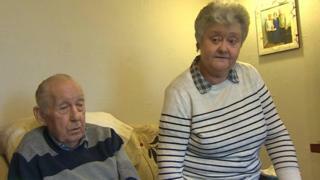 Alzheimer's sufferer Meirion Williams and his wife June live on the busy A470 in Blaenau Ffestiniog, Gwynedd. They are caught between the local authority that normally provide parking places and the Welsh Government which looks after the main highways. Mrs Williams is afraid her husband will have an accident if they park far away. She said parking the car outside the house is Mr Williams' main point of reference because he often gets confused due to his illness. Mrs Williams said a parking space would make life "easier and safer" as they also have many hospital appointments to attend. Parking places are usually provided by a local authorities. However when the couple asked Gwynedd council to grant permission for a space, they were declined because the A470 trunk road comes under the responsibility of the Welsh Government. However the Welsh Government said there has been no contact from the council. "One or the other should give me an answer. If it's 'no', then I would have to accept they won't help - but I do need that help. "It means nothing to us that it's the A470. It's our road that we live on, where we park and the road we go shopping. "Meirion's Alzheimer's is getting worse and he gets very confused. I'm afraid one day he will go out the door himself and won't know where he is because he won't see the car outside the house." Mr Williams said: "The car is the only thing we can put outside the house. If it's there, then I know for a fact that June is not far. "If it's not there, then I'm not sure which way to go, especially when you're on your own. I could be doing completely the wrong thing." Gwynedd council said any application for a parking spaces on the A470 is a matter for the Welsh Government to consider. The Welsh Government confirmed this and said: "Although the relevant powers are vested in Gwynedd council, the consent of the Welsh ministers (the national authority in Wales) would be required in order for Gwynedd council to make the required traffic regulation order." The Welsh Government said it was willing to discuss the matter though, as yet, Gwynedd council have not confirmed whether they have made an approach. In the meantime, Mrs Williams said the delay is causing added stress at the same time as her husband's condition continues to worsen.